The songs on Barbra Streisand's new compilation CD, Duets, will be instantly recognizable to anyone who has kept track of music over the past four decades — except, perhaps, the singer herself. "Once I make a record, I never listen to it again," says Streisand. "Sometimes I'll hear one of my records playing in a shop, and I'll think, 'God, that sounds familiar.' "
Duets, which arrived last week, features vocal collaborations spanning most of Streisand's career, including hits the diva recorded with such stars as Neil Diamond, Bryan Adams, Barry Gibb and Celine Dion. There are two new tracks, I Won't Be the One to Let Go and All I Know Of Love, which respectively pair Streisand with Barry Manilow and rising crooner Josh Groban. The process of putting together the older tunes "didn't have this nostalgic ring for me," she insists. "I've always lived in the moment, in the present." 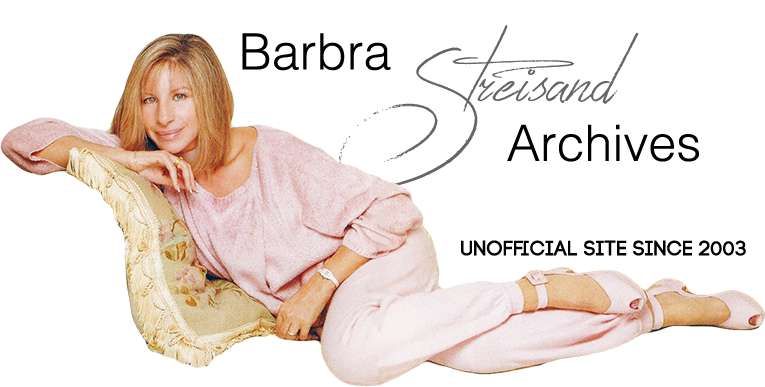 Accordingly, Streisand, 60, tries to retain an active interest in contemporary pop culture. The other night, for instance, she checked out the Eminem film 8 Mile. "I like things that are emotional, whether it's Billie Holiday or Eminem singing about his youth and his pain and vulnerability. I think he really understands the power of the inner self," she says. "I didn't always understand what they were saying in the movie," Streisand muses. "But it's a slice of real life. And I grew up in a very poor neighborhood, so I totally relate to that part of music today. That's a big part of me, that kid playing in the street." A part of Streisand that tends to get attention these days, of course, is her political activism. The singer spends a lot of time writing pieces for her Web site, which also provides links to other articles she finds interesting. Famously supportive of the Democratic Party, she was predictably less than thrilled with the results of the recent election. "I don't know if people really understand the issues," she says. "I mean, why would you vote for a party that would not give you clean air or clean water and a safe environment? We have a Democratic Party that's of, by and for the people, versus a Republican Party that seems to be of, by and for corporations." Though she retired from the commercial concert circuit two years ago, Streisand plans to continue performing pro bono at benefits. "It makes me angry when I see the cynicism of journalists who say, 'Oh, she's coming out of retirement' just because I sang nine songs to raise money for the Democrats. Being paid to sing 30 songs is very different from singing nine for a great cause." More studio albums also are on Streisand's agenda. Her next new release will probably be a collection of songs from movies. She wants to continue working on films as well. "It would be great to be in a movie that I don't direct and direct a movie that I'm not in," she notes dryly. "When I was making my last movie as a director, The Mirror Has Two Faces, I was also building and decorating a house. That's one of the reasons I actually made it — to escape construction."